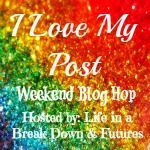 Welcome to the I Love My Post blog hop where we invite you to link up your favourite post of the week, to show it off and hopefully receive some love from the others partaking in the hop! If you are yet to participate in a hop they are really simple to get the hang of all you need to do is 'hop' around, hopefully finding some new great reads! Please just don't link up and click off to make this successful everyone needs to hop around! 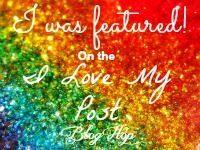 I would love it if you would tweet, share on facebook or place our button on your blog, the more sharing we can get happening the bigger this hop can become! If you have been featured grab our button!